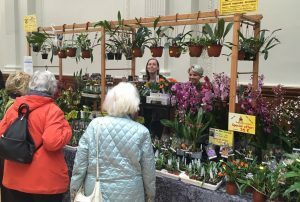 Orchid Project students have been doing their best to help other exhibitors this week, especially Frank Roellke who was taken ill and had to rush back to Germany leaving his display and sales plants behind. Chloe, Matty, Jacob and Zoe (with help from younger students too) stepped in and did a great job running Frank’s stand. As Chloe said, “It was brilliant being able to help out.” Here’s wishing Frank a speedy recovery. When we sat having a cup of tea beside the stand Mrs B and I wondered why the Writhlington staff were busy in and around the Roelke stand. Well done . for that and for all those wonderful exhibits you had.